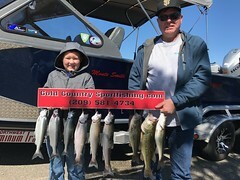 Returning client and friend Butch brought along his grandson Shane for a trip on the Sacramento River and since butch is friends with my dad he came along as well. The morning started off cool but knew it was going to be hot later on. I set four rods and were under way when I noticed a boat a head of us had just caught a fish and I seen a couple of people who I know they had two and were already heading in and it wasn’t even 7:oo o’clock yet. 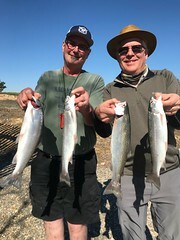 However after our first pass we had to make a pit stop for the restroom and after heading back up-stream I could feel we were going to catch a fish and within 50 yards we had a hard strike and shane grabbed the rod and soon we had a salmon in the boat. 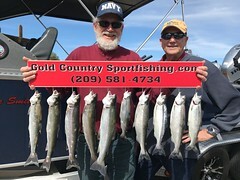 The day was slow for us and I think many others out as we only seen a couple other fish caught, however later into our second long pass one of the back rods doubled over and Butch was on the fish and after a short fight we put that fish into the boat and that was it for the day. Thanks again for coming out!!! !